Why is it important that wealth should be distributed evenly? Wealth should be distributed evenly amongst people as some people do not have the essentials such as food, water and shelter and are striving to survive. Within society, a standard family living in a home would have a microwave, two flat screen televisions, laptops, and iPhone per family member and even an iPod. Each member of the family would have their own bed with a soft mattress, pillow and blanket. Celebrities live in massive house containing more than 5 bedrooms when there is only one person living in the house. They live in luxury, wear expensive clothing and own maybe more than one expensive car. Do they, do we need all these expensive materialistic goods? No. There are people suffering with diseases, there are people starving and are suffering from malnutrition, there are people living on the streets begging for money and looking for shelter and there are people dying because they are unable to be treated with medicine or book an appointment at the doctors. If wealth was distributed evenly there wouldn't people dying or suffering as they would receive medication, there wouldn't be people looking for food, water or shelter as they would be able to afford a place to live and the world would be a better place. Mother Teresa wasn’t a wealthy woman but she did everything she could to try distribute things evenly. Her main goal of distributing things was not money, but it was love. Although having a disease and others not wanting to be around you because you could be contagious, the last thing a person would want is their family to not be around them to look after, love and take care of them. Knowing that there is no-one there for who truly loves you to take care of you is heartbreaking. 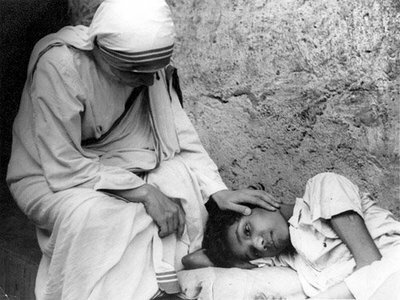 By Mother Teresa distributing her love towards other people, she gave a glimpse of happiness and hope to those who were unwanted and were dying that there was people such as herself who were willing to share their love. She put her life at risk to show her love such as caring, providing food and shelter to the ‘untouchables’. This had shown her true dedication of helping others and was well known to be a kind, caring, compassionate woman.